You've probably seen all the Texas Chainsaw Massacres. You know the way the plot usually goes. Yankees head down south for a road trip. They end up near the Sawyer homestead. Then the unthinkable happens. But the Sawyer family has other talents other than murder and chili. They are expert leather workers and wise in the ways of the shabby chic trend (emphasis on shabby) that's emerging from Texas at the moment. If only those who judged their harsh, murderous ways could see the Sawyer family Instagram count these days! 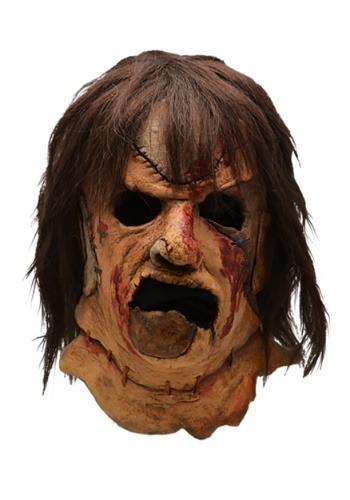 This particular mask is from Texas Chainsaw Massacre Three, showing Leatherface's shaggier style of that particular classic nineteen nineties movie. It has different colored patches of skin-like vinyl, stitching details, a tattoo, and gory red surface details. Shaggy brown hair falls around your face, giving you an extra spooky feel. With reclaimed barn wood, rusty meat hooks, and hand-tanned leather, the Sawyer Instagram page shows off fabulous decor for man caves, offices, and living rooms. Of course, because of their history, they offer apparel as well. While their aprons and blood splattered flannels often sell out, their masks are the most elusive products on their site. Luckily for you, we have a replica mask straight from the movie, just for you!